The AU student research team pictured with Klein and WIT members following their presentation. Maria Wallace, MSAn '17, has always been passionate about women's leadership—especially since she began her career in a traditionally male-run industry. "Information Technology Consulting is typically male-led," she explains. "Women have a lot to offer, and I think it's important we empower them to lead in the workplace." For Wallace, awareness of the gender imbalance wasn't enough. She wanted to take action. The team, organized through Women in Technology’s (WIT) Leadership Foundry, collected and compiled data to produce the sixth annual report Advancing Women to the Corporate Boardroom. The report examines corporate boards’ gender compositions, with the goal of increasing the number of women serving—and leading—in the boardroom. 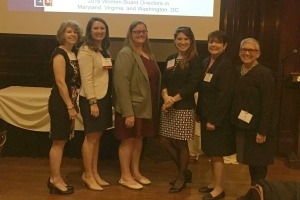 “Engaging graduate students in our now annual WIT research creates an outstanding opportunity to ‘pay it forward’ on behalf of senior executive women seeking board service opportunities,” says Klein. While the research process itself was rewarding, the true highpoint of the experience was presenting their work. “I didn’t fully grasp how important this was until we shared it with others,” Henderson says. The team presented their research at the Leadership Foundry’s November 2016 meeting, giving them the opportunity to exercise their public speaking skills in front of fellow women leaders. WIT’s Leadership Foundry, a nine-month training program for budding women board members, was both receptive and excited by the report. The fact the team met in person the first time for the presentation made their experience all the more fulfilling. Wallace, Randall and Henderson, all currently living in different cities, coordinated their research and presentation remotely through Business@American’s online campus. The online learning platform supports video calling, shared screens and voice recording, making collaborating from afar flexible and effective. Interested in Kogod’s Business@American online programs? Visit https://onlinebusiness.american.edu/ for more information.